What would have happened had Bastian not developed a thirst for fantasy literature? BAM! Right out of the gate with ds106 and you’ve totally nailed it. This works on so many levels with both the assignment and how many teachers view students that come from “non-reading” homes. This is actually really close to being a demotivator poster as well. Great work! This is nothing short of brilliant, all of my office had a huge LOL here. You rock! Thanks guys. This assignment was too fun to resist. My posts don’t seem to be hitting the DS106 site yet though. Do I need to do something else? Nicely done. No Falkor. 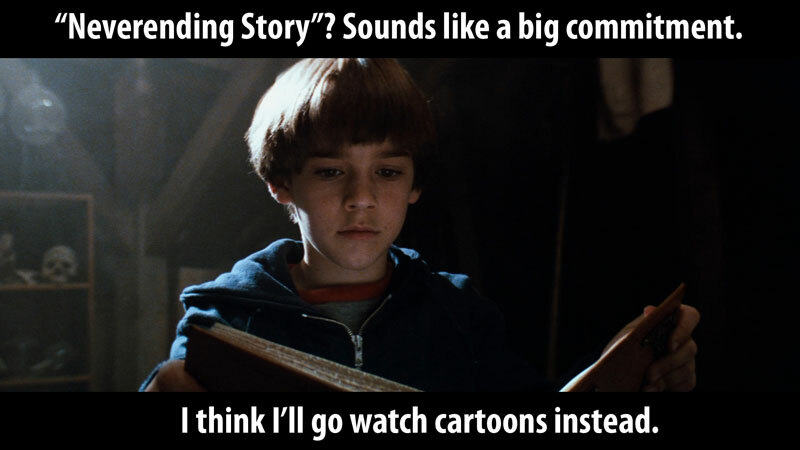 No Atreyu. On the plus side, no annoying princess to rescue either! John you’re feeding into the ds106.us site now. And this one kills the macguffin perfectly!